Aimol is one of the recognized tribe of Manipur (29th October, 1956 vide notification no. 2477, under Ministry of Home Affairs, Government of India). The total population of Aimol is 2,643 (2001 census) and is considered to be a critically endangered language by UNESCO. The Aimols are found in Chandel, Churachandpur, and Senapati districts of Manipur inhabiting 15 villages (11 in Chandel district, 2 in Churachandpur and 2 in Senapati district). According to myth, there once lived a man named Khoichungtepa. One night in his dream, he saw a meiwar “a fire like lightening” growing like a plant in the centre of his courtyard. He uprooted the fire plant and planted it in another place. He cared and nourished the plant by pouring jutui “wine”. The plant grew to become doi-ai “a magic power”. The man possessed this doi-ai and he used it to cure different kinds of sicknesses in the locality. He was also able to predict the future. Many people of the area come with their problems and the locality became very popular. As a result, the place came to be known as muolhui “comfortable place”. So the term Aimol is derived from the two words of doi-ai “magic power” and muolhui “comfortable place”. 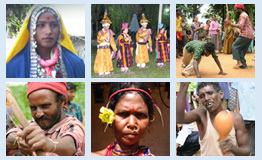 Aimol is a Tibeto-Burman language spoken in Manipur. The language has close affinities with other Kuki-Chin languages like Hmar, Hrangkawl, Simte, Sukte, Malsom, Darlong, Lushai, Thadou-Kuki, Kom, Koireng, Purum, Chothe, Chiru and Kharam. Manipuri or Meiteilon is used for communication with other tribes. The Aimols followed animism till the early part of the 20th century and believed in many deities and spirits. As part of the worshipping of these deities and spirits, there are 6 important festivals. However, with the advent of Christianity in the 1920s, all the 15 Aimol villages today follow Christianity and these festivals are no longer observed. The main occupation is agriculture and other activities include domestication of cow, buffalo, ox, pig, dog, duck, hen, etc. Rice is their staple food. Cultivation of paddy is carried out by both sexes. Weaving and livestock rearing is another source of income for the Aimol family. The present project aims to provide a brief phonological and morphological description of Aimol, resulting in a bilingual Aimol-English dictionary.